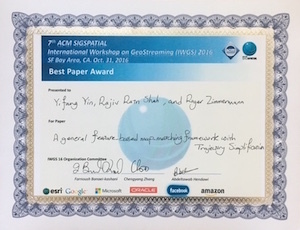 31 October 2016: Yin Yifang, Rajiv Ratn Shah and Roger Zimmermann have received the Best Paper Award for their paper entitled "A General Feature-Based Map Matching Framework with Trajectory Simplification" at the 7th ACM SIGSPATIAL International Workshop on GeoStreaming (IWGS 2016), which was held in conjunction with the 24th ACM SIGSPATIAL International Conference on Advances in Geographic Information Systems (ACM SIGSPATIAL GIS 2016) in San Francisco, California, USA. Congratulations! The award is also featured on the School of Computing news. 4 November 2016: Roger Zimmermann gave an invited seminar talk as part of the CS Seminar Series at the UC Irvine Department of Computer Science, Donald Bren School of Information & Computer Sciences. The talk was entitled "DASH Streaming with Software Defined Networking." 6 October 2016: Roger Zimmermann is one of the TPC Co-Chairs for the ACM TVX 2017 conference. The Call for Papers for the ACM TVX 2017 conference is now available online here. 31 October 2016: Roger Zimmermann gave a keynote talk at the 7th ACM SIGSPATIAL International Workshop on GeoStreaming (IWGS 2016), which was held in conjunction with the 24th ACM SIGSPATIAL International Conference on Advances in Geographic Information Systems (ACM SIGSPATIAL GIS 2016) in San Francisco, California, USA. The talk was entitled "‘Sensor’ Stream Processing, Analysis and Applications." 21 September 2016: In collaboration with the NUS Botany Laboratory, Department of Biological Sciences, the FloraSG Android app is now available in the Google Play Store. The FloraSG app is designed to provide information on native plant species in Singapore, and thus familiarise the user with some of these species. It can be used as a plant identification tool that works through the selection of a set of characters of plants which best fit the species that the user has encountered. Alternatively, the user may simply browse for information on a known species. Roopal Kondepudi and Rajiv Ratn Shah are the lead developers.